The Siege of Cawnpore began on June 5, 1857 and continued for 20 bloody days. This Indian rebellion was led by forces under Nana Sahib. The British troops who were stationed in India during this uprising were unprepared for an extended siege and surrendered to Sahib. In return, they were promised safe passage to Allahabad. Unfortunately, evacuation from Cawnpore (now known as Kanpur) did not go well. The tense circumstances caused things to boil over, and a massacre ensued. The treatment of non-military personnel during this skirmish was especially barbaric. During what became known as the Bibighar Massacre, over 120 British women and children were captured and hacked to death. British troops, eventually restoring some semblance of order to the area, were severely traumatized by these events, and many of them vowed revenge. "Anne Perry’s Christmas mysteries have been a welcome addition to pre-holiday reading lists for many years.... [T]he spirit of the holiday season is well represented, and the symbolism of the Christmas garland within this tale is both heartwarming and touching." It is in the wake of these very real and incredibly sobering events that Anne Perry has set the stage for her 10th Christmas mystery. A British medical assistant named John Tallis has been apprehended and charged with the brutal slaying of a Sikh by the name of Chuttur Singh. Chuttur was loyal to the British cause, but the recent events during the siege may have left a bad taste in the mouths of many of the shell-shocked British soldiers, and no one questions why this murder took place. What they don’t have is a witness, confession or actual motive as to why Tallis would take leave of his senses and commit such a horrific crime. Seeking swift justice --- and a semblance of payback --- the British troop leaders assign a fledgling officer named Victor Narraway to defend Tallis. Fans of Perry’s novels will instantly recognize Narraway, who has had a recurring role in many of her mysteries over the years. Narraway does not believe that Tallis committed the crime. Still, Tallis is resigned to the fact that the troop needs someone to go down for the crime and takes his eventual hanging in stride. The military courtroom scenes are intense and start out as predictable, only to take twist after twist as Narraway navigates within the boundaries of military justice and the slightly conflicting stories of the few potential witnesses he is permitted to call to the stand. One point that Narraway cannot get past is the fact that Chuttur was killed while guarding a rebel Sikh named Dhuleep Singh. Some of the additional testimony given by other soldiers forces Narraway to examine all the relationships deeper. As the clock races on, he is unsure if his hunches will work out, and he may see an innocent man hung just before Christmas. 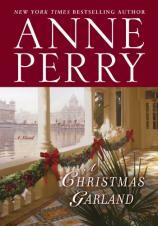 Anne Perry’s Christmas mysteries have been a welcome addition to pre-holiday reading lists for many years. At times, though, the stories only thinly glance over the actual subject of Christmas Day. Nevertheless, the spirit of the holiday season is well represented, and the symbolism of the Christmas garland within this tale is both heartwarming and touching. At one point, it is said of Victor Narraway that “he wanted to save Tallis so badly it was like a physical pain inside him, as if something necessary for survival was missing and the emptiness was going to eat him away.” Readers will find it impossible to feel otherwise, and the plight of Narraway in THE CHRISTMAS GARLAND is well worth following.